The Port Manager of the Antigua Port, Darwin Telemaque on Tuesday recommended that Trinidad become a regional shipping hub to help bring down transportation costs and reduce reliance on Miami. “If you start thinking about what’s Miami… Trinidad has more potential than Miami because they make things. Miami does nothing. 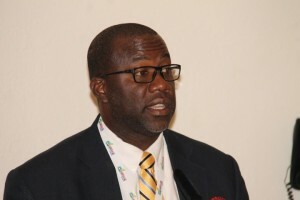 They just receive things and distribute so we have an opportunity in our own back-yard to build from something that can grow into something great but we remain insular,” he told a seminar on Agricultural Trade and Transport at the Caribbean Week of Agriculture being held in the Cayman Islands. Telemaque argued that that oil-producing nation has “all of the natural capabilities” such as consolidators, distributors and a strong industrial base. The Port Authority official said it is best to develop the facilities in Trinidad to serve the entire region rather than spend an estimated US$1.5 billion on constructing new facilities. Jamaica and Cuba have in recent years been spending huge sums of monies in developing shipping facilities. He observed that Antigua has proven to be one of the most expensive ports in the Caribbean islands. He traced the decline in the number of shipping liners from 19 in 2009 to six at the moment, resulting in shipping becoming less competitive and costlier. The Antigua Port Authority Manager said the Caribbean does not have a problem with the volume of food that can be produced. “We don’t have a production problem. You have market issues. If a farer believes he can sell, he plants,” he said. He argued that Trinidad provides the best opportunity to have a South Florida shipping model in which goods and produce can be shipped across the region swiftly and at a low cost rather than having them come directly from Florida. “Let’s design a method to ensure that it arrives to you at the requisite time,” he said. Telemaque noted that while Caribbean countries have a rather free-market system of operation, South Floridian authorities often ensure that services being provided by external entities do not threaten American providers. He recommended that third party logistic services that deal with rates, routes, scheduling and packaging be provided in each Caribbean country. Those service providers, he added, would be responsible for the shipment of goods through the best available routes.